A collection of ten Renaissance Italian poems, complemented by contemporary English versions and photographs. This volume provides a unique visual and literary context for Italian poet Vittoria Colonna’s classical, spiritual themes. The first woman to achieve wide recognition as a poet in Renaissance Italy, Vittoria Colonna was known for her ardent, but also deeply spiritual, verses. This volume reproduces ten of her sonnets in the original Italian alongside new English versions of compelling simplicity, and complements both with a sequence of moving black and white photographs. Governor General’s Award winner Jan Zwicky gives Colonna’s spiritual insights a contemporary voice, while photographer and noted mathematician Robert Moody paces her words against a visual meditation on the Passion story, as conveyed by Subirachs’ sculptures for the basilica of the Sagrada Familia in Barcelona. The volume’s juxtaposition of poetry and photography illuminates the passion, reverence, and timelessness of both Subirachs’ and Colonna’s work. The raw honesty and power of sixteenth century poet shines through in Zwicky’s translations. 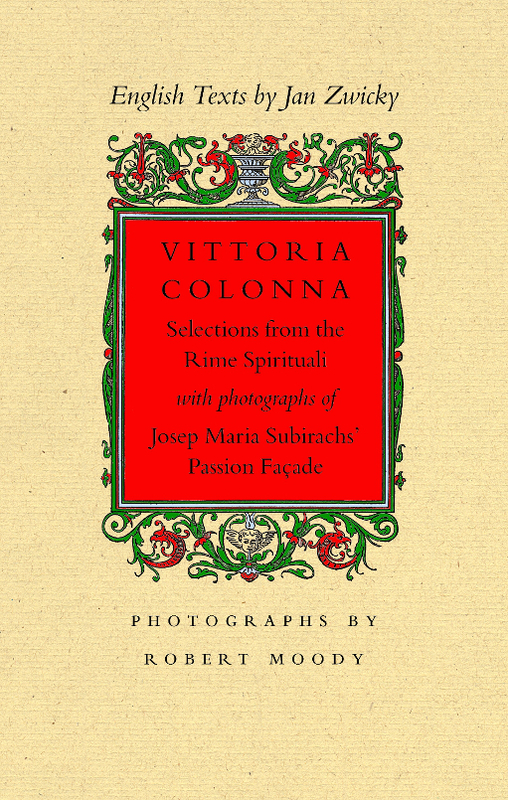 Jan Zwicky presents her translations of ten sonnets from Vittoria Colonna’s Rime Spirituali, accompanied by stunning photographs by Robert Moody, in Vittoria Colonna: Selections from the Rime Spirituali. Colonna is not a well-known figure. She was a wealthy sixteenth-century woman who sought the refuge of the convent after she was prematurely widowed. She wrote other forms of poetry, but her later years were marked by meditative religious poems, which came to be known as her rime spirituali. Colonna was an intriguing woman who associated with religious reformers and was a close friend of Michelangelo’s. "All the while my widowed love / flushed me with thoughts of literary fame, / it fed a serpent in my breast / and now, afflicted, languishing, / my only remedy is God." As this quotation makes clear, these are free verse sonnets, and for this reason, Zwicky calls them versions rather than translations. Even for those who, like Zwicky, don’t share Colonna’s Christian background, this and other poems serve as moving ruminations by a person in search of something more than what she sees around her. For those inclined to investigate the source text, each sonnet is featured in the original Italian opposite its translation. The other piece of this partnership of words and images is Moody’s collection of photographs. The ten images don’t directly correspond to the subjects of these poems, but rather serve an overall purpose of placing the reader deeper into the spiritual world Colonna was surrounded by. The photos show scenes from Josep Maria Subirachs’s Passion Façade, part of the exterior of the basilica of the Sagrada Familia in Barcelona. Moody, a mathematician as well as a photographer, captures the controversial, heavily angled sculptures’ dramatic lines in black and white photographs that perfectly utilize shadow and light. Zwicky and Moody’s collaboration doesn’t have much weight in the traditional sense—lacking in heft, the book can be read in less than an hour. But in another sense, the book’s weight is tremendous; in these short translations, one gains a unique and deeply personal insight into the mind of a woman both haunted and liberated by her beliefs. Vittoria Colonna was born into a rich and powerful family at Marino, near Rome, in 1490 or 1492. She was betrothed at a very young age to Francesco Ferrante D’Avalos, and in 1509 was married to him. They lived together near Naples for two years before D’Avalos left to fight in the wars against the French. She saw him only infrequently after that, although they corresponded. There were no children, and in 1525 D’Avalos died as a result of injuries sustained at the battle of Pavia. Colonna retreated to the convent of San Silvestro in Rome and professed a desire to take orders but was forbidden to do so by both her brother and the pope. It is thought that, although they belonged to opposing factions, both men were alert to her political value as a marriageable property and did not want her sequestered in a convent. Colonna did not, however, remarry, and this refusal appears to have been crucial to her success as a writer. She made her reputation as a univira—a once-married woman who remains loyal to her dead husband. By this means, whether innocently or with forethought, she was able to defuse the intense hostility usually displayed towards women who attempted to cultivate a public voice. Such women, unless they were nuns of spotless repute, were routinely denounced as lascivious whores—insufficiently under the thumb of their male relatives, and so likely to subvert the lines of patriarchal inheritance. But the adoring married love Colonna celebrates in her early poems, the so-called rime amorose, was regarded with approbation by the male establishment, despite its secular nature. And so she became a model for other women poets of the period: they were subsequently able to find their way into print citing Colonna as their exemplar. At first Colonna’s work circulated privately, but as her reputation grew, so did the interest of publishers. In 1535, ten years after D’Avalos’s death and at the end of her self-imposed period of mourning, Colonna allowed a sonnet she had composed for Pietro Bembo to be published in the second edition of his own Rime, which Bembo brought out in 1535. In 1538, Rime de la Divina Vittoria Colonna Marchesa di Pescara was published, without Colonna’s authorization, in Parma by Philippo Pirogallo. Thirteen subsequent editions followed during her lifetime, and nine after her death. The first four of these contained only selections from the rime amorose, but all subsequent editions, starting in 1539, included examples of her so-called rime spirituali, the meditative religious poems to which she turned in the later part of her life. In the late 1530s, Colonna returned to San Silvestro. An intense friendship with Michelangelo began in this period, and she compiled a gift manuscript for him around 1540, consisting of 103 rime spirituali. The manuscript is plainly bound and there is evidence that Colonna closely supervised its preparation. In many instances, versions of the poems that appear in the manuscript are materially different from versions that appeared in print. About the same time, Michelangelo gave her a series of three presentation drawings exploring Christian themes that figure centrally in Colonna’s work. The two are said to have talked long hours together, and they wrote to one another frequently. Michelangelo’s sonnets and madrigals to Colonna are among the finest and most passionate he wrote: it appears that she was the last, and perhaps greatest, love of his life. Colonna’s sonnets are more oblique in their address; it is always possible to read them as purely religious meditations. Nonetheless, if we imagine them written for and presented to Michelangelo, there can be little doubt of her deep and intimate regard. Colonna was deeply interested in religious reform, and from the late 1520’s was repeatedly drawn into association, and in some cases close friendships, with reformers. The presence of reformist ideas is marked in the sonnets, particularly the idea that genuine faith rather than institutional observance is essential for salvation. Colonna does not write, however, as someone attempting to paraphrase ideas not entirely her own. She writes with the directness and intensity that attend personal vision. Indeed, central images and core vocabulary are carried over from the rime amorose into the rime spirituali to striking effect. Her work is—to use a word that figures frequently in her own poetry—ardent. And it was this, I believe, that drew Michelangelo most strongly to her. He found in Colonna someone who understood life as he did: a passionate endeavour to come to grips with spiritual truth. Colonna died in poor health in the Convent of Sant’Anna de’ Funari in 1547. Michelangelo was distraught at her death and following it retreated from society for the remainder of his own life. The photographs that interleave the poems of Vittoria Colonna in this volume are not intended to speak directly to her thought but rather to form a backdrop or canvas for the deeply Christian sentiments on which they are based. With the exception of one, they are photographs of Josep Maria Subirachs’ Passion Facade, which is part of the exterior of the basilica of the Sagrada Familia in Barcelona. In the sparse lean angular figures and the strong geometry of the settings, the story of the suffering and tragedy of the passion of Christ loses none of its universal power. In fact quite the opposite. As with Jan Zwicky’s versions of Colonna’s poems, the modern aesthetic brings new freshness and insight to these classical themes. The Passion Facade was part of Antonio Gaudi’s personal vision for the basilica and arose from his own experience of intense suffering, though the actual design of the sculptures was never completed in his life. When Subirachs was commissioned to create the work, his single request was that he be free to follow his own artistic muse. The resulting work is something very different from anything Gaudi would have envisioned. As Subirachs points out, Gaudi believed that the curve, with its rounded and organic fluidity, was the true line of God. Subirachs’ geometry is starkly linear and angular, but speaks well to dramatic tensions of the passion story. The single exception to the work of Subirachs among these photographs is the view upwards into the light-filled central spire of the basilica. This is pure Gaudi. We offer it as a visual correspondence to the final transcendence described in the Christian story. 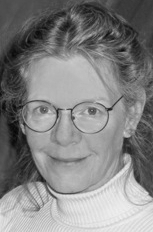 Jan Zwicky is a poet, philosopher and musician whose work is often cited for its intense lyricism. She studied philosophy at the University of Calgary, then earned her Ph.D. at the University of Toronto, and subsequently taught at a number of North American universities. She is a prolific essayist and the author of a dozen books, including Lyric Philosophy and Wisdom & Metaphor. Her poetry has won the Governor General’s Award (Songs for Relinquishing the Earth, 1998), the Dorothy Livesay Poetry Prize (Robinson’s Crossing, 2004), and numerous other accolades. Originally from the prairies, Zwicky now lives on Quadra Island, British Columbia. 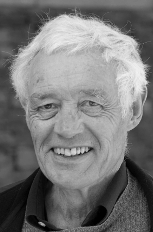 Robert Moody is a mathematician whose professional life has revolved around the mathematics of symmetry and long-range order. Moody studied mathematics at the University of Saskatchewan and the University of Toronto, before joining the faculty at the University of Saskatchewan and, later, the University of Alberta. He is internationally recognized for his co-discovery of what are known as the Kac-Moody algebras, one of the significant advances in mathematics in the latter half of the twentieth century. His enduring pursuit of black and white photography, with its emphasis on simplicity, form and abstraction, is a visual complement to his mathematics. He is a winner of the Wigner Medal and is an Officer of the Order of Canada. He makes his residence in Victoria, British Columbia.